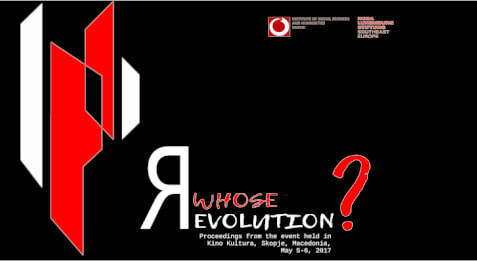 ISSH-S is glad to announce the release of our newest publication, a follow-up of an event held on May 5-6, 2017 in Skopje – Whose Revolution? Proceedings from the event held in Kino Kultura, May 5-6, 2017, edited by Stanimir Panayotov. The publication includes contributions by Luka Matić, Katerina Kolozova, Branimir Jovanović, Vladimir Simović, Irena Cvetković, Florin Poenaru, Ivan Radenković, Ana Blazheva, Artan Sadiku, and Anastas Vangeli, and is freely downloadable from the link below . Summary: This publication gathers the presentations, as well as the discussions, from the event “Whose Revolution?” and is meant to document the analytical momentum after the second anniversary of the #protestiram movement in Macedonia, drawing on analogies and different experiences from the region too. Two panels were organized with the participation of regional activists and theoreticians. We have witnessed massive popular mobilizations in the region in the last few years. But many of them were often coopted by liberal tendencies ending up with little or no serious changes within the society or system. At the same time, we see the rising right-wing populist movements across Europe who claim to be pursuing an anti-establishment revolutionary path. Caught between these two fires, we wanted to reproach the concept of revolutionary politics today and rehabilitate the “revolution” in its socialist bedrock. The publication is financially supported by Rosa Luxemburg Stiftung – Southeast Europe.